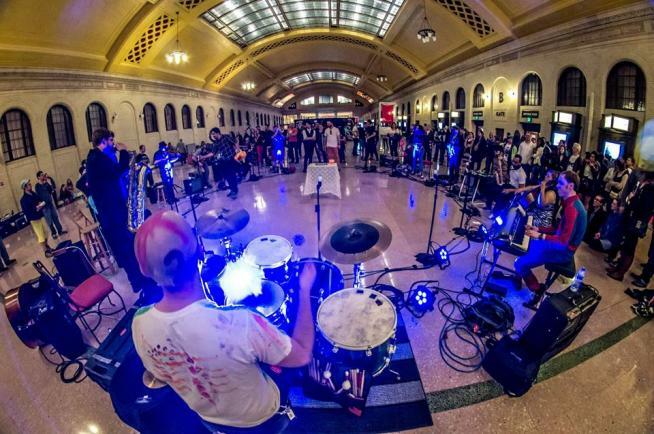 Gossip Orchestra 2013 Union Depot. Image courtesy the artists. Gossip Orchestra 2013 Union Depot. Video courtesy the artists. Gossip Orchestra is an interactive installation with twenty musicians positioned in a large circle. Audience members have the opportunity to step within this circle and take the role of “conductor” or “composer.” The conductor may activate or deactivate any of the musicians in any combination by using a full body control board; the musicians will be silent until cued by the conductor. Colored lights appear in front of each performer to signify when any individual musician is turned on or off. Once turned on, the musician is free to improvise music. The conductor can then selectively activate other members of the orchestra, creating an ensemble of two to twenty musicians improvising with one another. The “composer” is simultaneously employed in this exercise as each person who steps in the Gossip Orchestra circle will have access to a “mood switch” that controls the color of light on the performing ensemble, acting as an emotional guide for the musicians to express in their improvised music. This installation will be audibly and visually stunning: the universal language of interactive and improvised music will be controlled by the imagination of the audience, and Gossip Orchestra will create a transcendental music experience that your senses have never known.